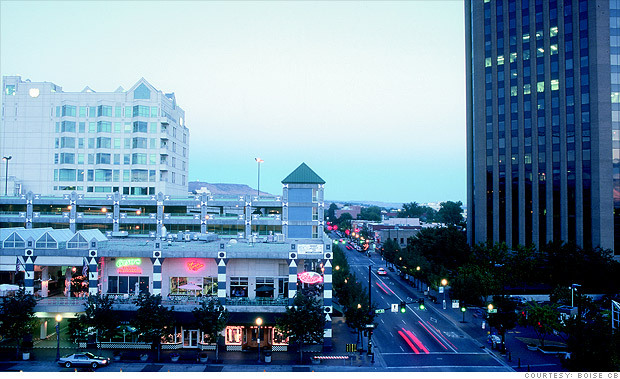 Boise's economy is an offbeat combination of old and new. The logging industry still pays a lot of the bills in town, but tech jobs have also become increasingly prevalent. In fact, chip maker Micron Technology is Boise's biggest employer, according to the Boise Valley Economic Partnership. And lately, the food industry has heated up, enabling many of the area's agricultural-based companies to pump out increased profits, according to Clark Krause, the organization's executive director. "We're hopeful that things are turning around," he said. "Even during the bad times, we had a net immigration of people and now there's a lot of new investment in construction and other industries." That diversity of employers -- and the growing number of jobs they're offering -- is a prime reason this town is starting to stage a comeback.